A bone bruise results from compressive forces incurred during an injury. 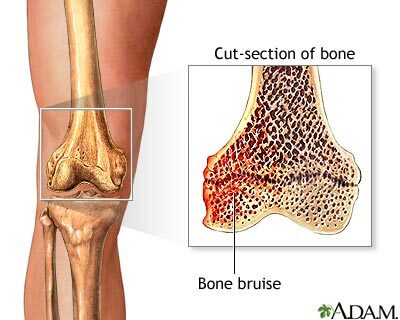 The damaged area occurs in the medullary portion of the bone and can be accompanied by bleeding and swelling. Bruises are often caused by falls, sports injuries, car accidents, or blows from other people or objects. Bruises can last from days to months, with the bone bruise being the most severe and painful.